Doorways should be wide enough for wheelchair users (900mm. minimum). 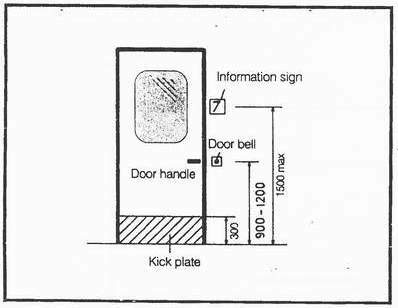 Space to manoeuvre should be provided in front of doors, including sufficient space for moving past door handles. Thresholds of doorways should not exceed 10 mm. 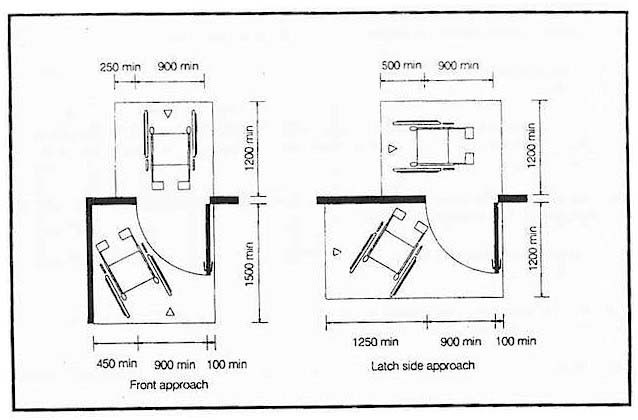 Raised threshold and floor level changes at doorways should be levelled off with a slope on each side of a threshold. 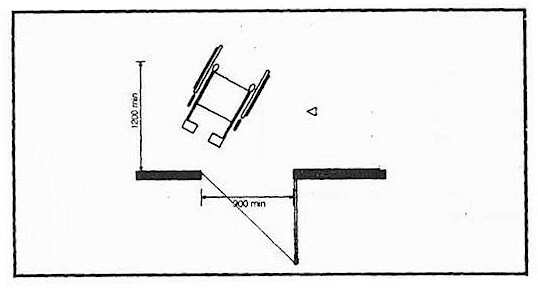 The slope may be a simple, movable ramp. Handles, pulls and others opening devices are to have a shape and height that is easy for a person with reduced strength and dexterity to control. Swing door is preferable than sliding door. When a sliding door is to be used, the handle should be usable from both sides. The use of colour to distinguish doors from surrounding walls is very useful for people with visual impairments. Glass doors must have a bright, coloured motif at eye level. Where revolving doors or turnstiles are used, an alternative wheelchair-accessible entrance must also be provided. Figure 2.5c : Outside of door.